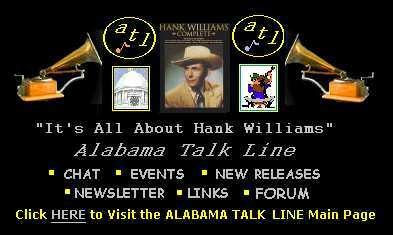 "It's All about Hank" Feel free to post a message about Hank Williams and His Music. Unfortunately, due to heavy SPAM, we have been obliged to LOCK this forum. If you wish to post a message, send email to internetaction@yahoo.com and we will post it for you. special guest Terri Lisa on Feb. 11. “Hank Williams,” including songs that have not previously been on RFD-TV. TV network in the US, and Church is their "most requested and most popular"
number 1 songs on independent charts. documentary DVD, “Behind The Microphone” by the legendary DJ Lew Dobbins. almost every major country star from the 60’s to recent years. at ROPE events during the CMA Fest in Nashville right beside many major acts. Monday – Friday, 10 a.m. to 1 p.m. and Saturdays from 10 a.m. to 3 p.m.
also available online at www.caillouxtheater.com.